It was the label's first runway show at the bi-annual style fest, having previously opted for Instagram-able presentations, held this time in the lofty surrounds of the iconic New York Public Library. 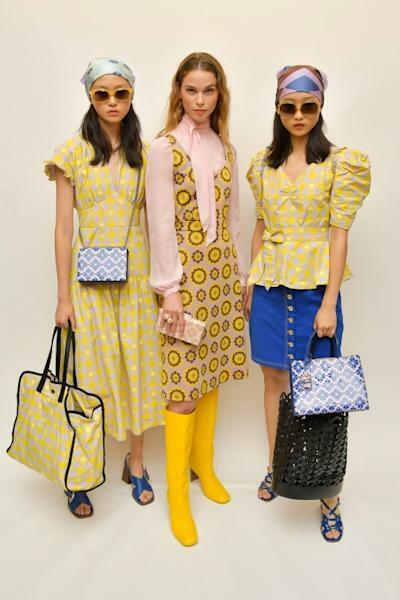 The new creative director, Northern Ireland-born Nicola Glass, was already working on her debut collection when 55-year-old Spade, who founded the company with her husband, committed suicide in June. Silver glitter ran down the center of the pale pink-carpeted runway, a nod to the woman whose brand has been synonymous with a joyful outlook on life since its founding in 1993. "She left a little sparkle everywhere she went," said a pink note left on the seat of every guest. "In loving memory 1962-2018." "Even though she hasn't been here for over 10 years, her spirit's definitely still here at the company," Glass, a former Gucci handbag and jewelry designer who previously worked at Michael Kors, told AFP. The collection was rooted in the brand's DNA: color, fun, joyfulness for spirited women, sophisticated and feminine, yet wearable from day to evening. 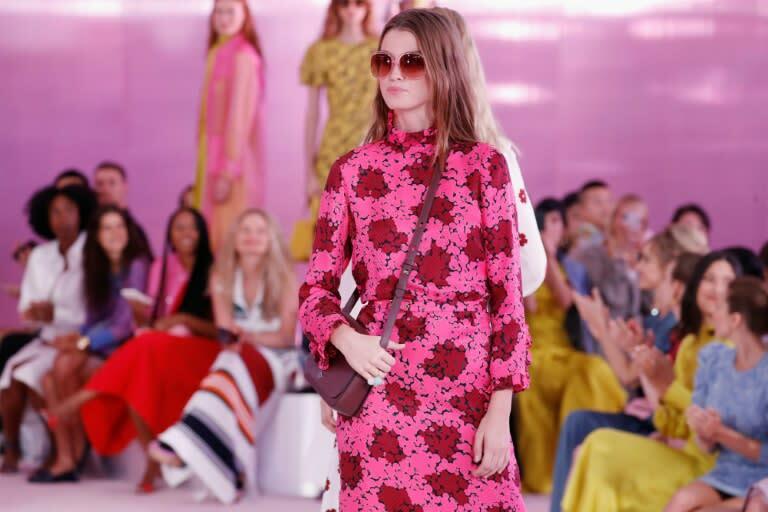 Kate Spade's spring/summer 2019 is one of pale lilac, hot pink, dark green, chartreuse, florals and print, with block-heeled sandals and knee-high boots, and liberal use of the spade symbol. "It feels more modern, less retro, there's more polished ease to it and prints, they've been evolved in a way where they're a little bit more graphic with unexpected details," Glass told AFP. Pale white balloon-style lights were suspended from the ceiling and an unusually diverse stream of models, although each very slim, strode the runway before taking their places on silver diases. Besides the silk dresses, cropped pants, checked suiting and buttoned mini-skirts, they sported purses, sunglasses and silk headscarves knotted at the nape of the neck. "She's a woman who, I think, is in love with life and has a sense of purpose," said Glass. Spade sold her last shares in her namesake brand in the mid-2000s. The company is now owned by Tapestry, but Glass hailed Spade as a role model woman, entrepreneur and designer. Spade committed suicide in her Park Avenue apartment on June 5, having battled with depression and anxiety for years despite a dazzling career that made her the darling of American career women. Guests of honor were Oprah Winfrey, Anne Hathaway, Jessica Chastain, Blake Lively, Pierce Brosnan, Kanye West and Priyanka Chopra, as well as Donna Karan, Michael Kors and Carolina Herrera were in attendance. Models sashayed through the oriental rug-lined Bethesda Terrace fountain in Central Park, before a frail looking Lauren, dressed in jeans, dress shirt and black tux, came out to a standing ovation, doing a lap of honor and tenderly embraced by his guests of honor. Dozens of models, of every conceivable color, ranging from almost babes in arms to grey-haired men, encapsulated 50 years in which the 78-year-old has literally dressed America -- his Ralph Lauren and Polo labels a one-stop shop for evening, day, business and sportswear. "In celebration of 50 years, I celebrate a woman's freedom of expression, her strength and individuality," he said simply. 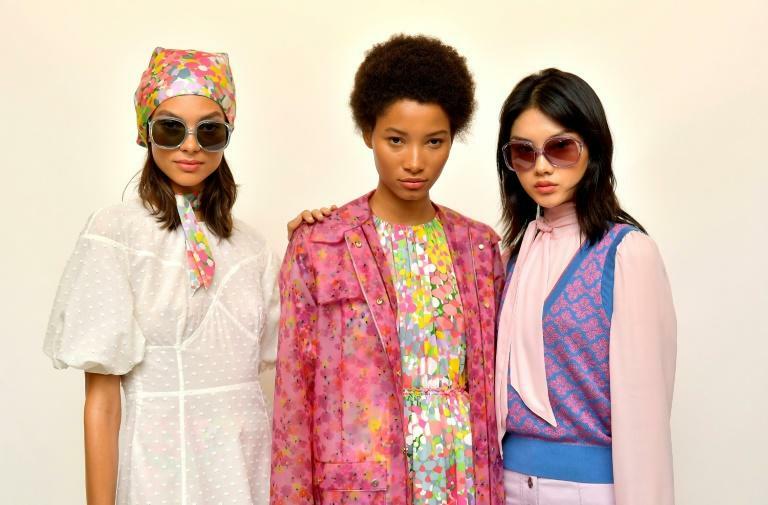 The American founder of the global lifestyle brand Tory Burch was upbeat and happy, unveiling a collection, imbued with the memory of her wealthy parents and their Mediterranean cruises. The clothes were inspired by their steamer-hopping trips from Italy to Greece, and from Spain to Morocco, full of contrast from Cyprus lace to North African djellabas, and from flamenco flounces to safari suits.